"Mutual understanding, cooperation and good neighborly relations among nations and religions lay a path towards a happy future," Head of the Caucasus Muslims Office, Sheikhulislam Allahshukur Pashazade, said at the opening ceremony of the international conference. Pashazade was re-elected as chairman of the Advisory Council of the CIS Muslims for the next five years during the second meeting of the council. The event is attended by representatives of religious confessions in Azerbaijan, members of the government and parliament, representatives of scientific and cultural intelligentsia and the diplomatic missions accredited in Azerbaijan. 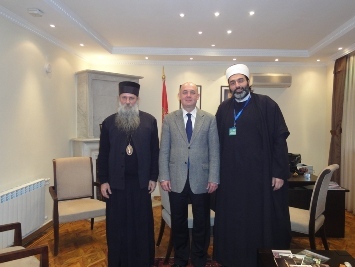 Boshop of Ulpiana Jovan Vicar Bishop of Serbian Patriarch and Serbian Mufti Muhamed Jusufspahić were attended the conference from the Republic of Serbia. In the framework of the international conference the heads and representatives of the Muslim communities of the CIS adopted a final document. According to the document, the main purpose of the meeting was strengthening the interaction of Muslim communities in the CIS, joining the efforts of Muslim religious leaders in the spiritual combat against the increase of radicalism and reconfirmation of commitment to multiculturalism and tolerance. The Serbian officials have visited the Embassy of the Republic of Serbia to the Republic of Azerbaijan. The Ambassador Extraordinary and Plenipotentiary of the Republic of Serbia to the Republic of Azerbaijan Zoran Vajović welcomed the Serbian delegation.